Will Birds of Prey scribe Gail Simone pen Buffy the Vampire Slayer Season 9? 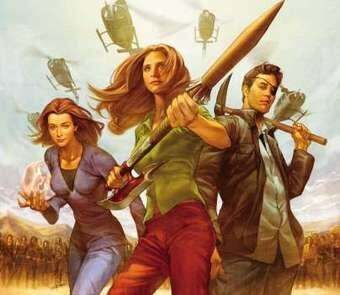 The eighth season of Buffy wraps up January 19, but the Whedon camp's already planning ahead. According to Birds of Prey writer (and "Women In Refrigerators" coiner) Gail Simone, she's been given a carte blanche opportunity to helm Season 9. Over at the Jinxworld forums, Simone revealed that the gig is hers if she wants it ("They asked me to, they said I can write as much Buffy as I want, and they sent all the tpbs for me to look at. They have been pretty wonderful, actually!"). Given the Simone's crackerjack at writing strong female leads (she's also pretty damn good at writing macho braggadocio; see her runs on Secret Six, Deadpool, and Agent X), this is a pairing we like quite a bit.